Who are the Andy Weaver Amish? The Andy Weaver affiliation (or “Dan church”, as it is locally known), originated in the Holmes County, Ohio Amish settlement. Numbering about thirty church districts in Holmes County, they occupy a place between the Old Order and Swartzentruber churches. The Andy Weaver Amish affiliation formed in the Holmes County settlement 1952 over the issue of shunning. Roughly half of the members of a congregation located in the northern half of the settlement disagreed with church leadership’s position on strict application of shunning, and formed a splinter group. This breakaway group eventually received ministerial assistance from elsewhere in the settlement. Meanwhile, the remaining half of the church consolidated support for the strong application of shunning among other churches. Mediation from bishops from outside settlements did little to resolve the conflict. By the mid-1950s, five districts found themselves aligned in support of the more conservative position, and took their name from Andy Weaver, an articulate young leader. The breakaway group was assisted by ministers from other districts and eventually ordained their own ministers, aligning with the majority of the Old Order Amish churches (An Amish Paradox, Hurst/McConnell, pp 43-48). Today there are approximately 30 Andy Weaver districts in the Holmes County settlement. Andy Weaver settlements exist outside of Holmes County, including in Ashland County, Ohio, and in upstate New York. 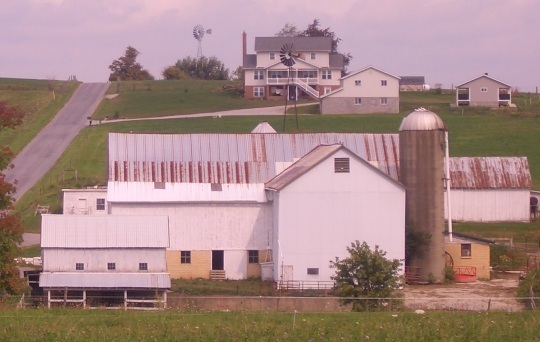 Though the original reasons for division were only indirectly connected to technology, Andy Weaver are marked today by a more conservative approach to technology than the Old Order Amish. Amish scholars Hurst and McConnell note that differences in technology usage have increased after differing little in the first thirty years following the church division. Over the past two decades, “the technological gap between the Old Order and Andy Weavers has widened, as the former adopted milking machines, tractors in the the field, portable generators, hydraulic power, and balers. Moreover, the Andy Weavers have resisted the adoption of everyday household conveniences such as bicycles, power lawnmowers, garden tillers, and rental freezers” (Paradox, Hurst/McConnell, p47). Interestingly, Hurst and McConnell note that the Andy Weaver Amish are in fellowship with the Old Order Amish in Lancaster County, a group which accepts a much higher level of technology, but which shares the Andy Weaver approach to strict shunning. Andy Weaver Amish are noteworthy in that they exhibit one of the highest rates of retention among Amish, estimated at 97%, versus 86% for Old Order Amish and 60% for New Order Amish. At the same time, Andy Weaver Amish have left agriculture at higher rates than other Amish, with only 6% active in farming (vs. 10% of Old Order and 15% of New Order Amish), perhaps due to the difficulties of competing with limited dairy technology (Paradox, Hurst/McConnell, p80 and p197). 9 responses to Who are the Andy Weaver Amish? My current non-fiction book, Amish Reader, explores some of the differences even within communities. This is democracy in action with bi-annual open forums held after church service for the baptised. Hi Richard, sounds like an interesting book, what communities did you research in? All my books are sold out and I will not reprint. At 78 years old, I’m cutting back on activity. Writing is the easy and fun part of publishing. Marketing is the hardest—as you well know. I have your book. I still do PowerPoint talks, and get hired as a step on guide to 5 southeast WI Amish communities as day trips to spread the word as to who the REAL AMISH are. Sorry I’m also late answering your comment. I do not watch facebook regularly. All my Amish REader books are sold out, as well as all the other 7 books I wrote about my experiences with the Amish, Mennonites, and Hutterites. I still make talks to groups, and am a step-on-guide for groups that get the bus. I have 5 settlements in SE Wisconsin that enjoy my tours. I reread the Andy Weaver / Dan Church Amish article again, and an odd question struck me. Well, I thought it was odd. Is Mister Andy Weaver still alive today? Is he still involved in the leadership of his community? I thought maybe since he was active in the 1950s he’d have a chance of still being around today as a reasonably elderly man. An interesting question Shom, though I do not know the answer. If so he’d have to be in his 80s at least. Not sure I ever read this article before. I have a friend that is a memeber of the Dan May Church (Andy Weaver Church) I find it interesting how critical they can be towards the Swartzentrubers when in essence they are truly not that different…very slight differences. The better part is when I have stayed with them for a couple days then go to my Old Order Friends and how modern it seems things are at the OOA home!! The one thing I thought was laughable was that the Dan May can not believe that the Swartz would use kerosene laterns…yet…the DM use Solvents to cook with…light the home…more flammable than kerosene!! Leave a reply to Who are the Andy Weaver Amish?